Even if you don't think you will ever drive off the paved road while towing, you just might find that the campground you wish to stay in has unpaved or gravel roads that you may find challenging. Here are a few tips to keep you safe while towing off the beaten path. When traveling off the hard surface of the road, remember that gravel, sand or dirt offer less traction to your wheels in both accelerating and stopping situations and especially in hill climbing. If you must take your trailer to the bottom of a steep hill, be sure the return route up to the top of the hill is straight enough that you can make a run for it. Loosening your weight distribution bar chains or adding rocks or other weights to your trunk might get you out of a tight spot if you stall, slipping your drive wheels on a very steep hill. If not, you may have to call for help from another tow vehicle. Roads causing this kind of problem are rare but some of the most beautiful campgrounds might have just such an entrance. Some campgrounds do not accept reservations, but try to make one whenever you can. If possible, arrive early so you can inspect and choose a site during daylight hours. Try to avoid sites near a swamp, stream or other bodies of water that may harbor insects and mosquitoes. Avoid parking under dead trees or loose limbs that might fall and cause injury or damage. Stay away from areas that show signs of flash flooding. DO NOT park on private property without first obtaining the owner’s permission. A good rule to follow upon deciding whether to go “down into” a camp area from a major road, is to stop at the main road and walk down first. Observe the size of trailers already parked and what type of tow vehicles brought them in. If yours is comparable, it’s reasonable to assume you can get in and out as well. Take a good look at where you can park and plan your approach to maneuver for parking. Take into consideration any sharp turns, low branches, large boulders on the road edge or any other obstacles that could cause damage. If you have a heavy trailer and all you see in camp are lightweights, check carefully to make sure that your larger rig can enter safely, park comfortably and leave easily. Steep loose graveled grades are much easier to drive down into than to pull a heavy load up. Camping will be more enjoyable for all in your party if you are careful not to get your RV into a situation that requires help (sometimes professional), to get out of. When you get to your campground, if it is windy, try to position your RV so that the wind will hit on the corner rather than broadside or on the end. This will lessen any buffeting from the wind. Park the appliance side out of the wind to prevent the pilot lights from blowing out. When driving through camp areas be aware of overhead obstacles which could cause extensive damage to roof mounted RV antennas, roof vents or roof mounted air conditioners. Trees that lean in toward the roadway at an angle can be deceiving and it is easy to misjudge clearance and badly scrape a top edge. Even small limbs can cause a great amount of damage. A good way to bypass obstacles is to position an observer where they can guide you by safely. Some RV’s have more ground clearance than others. If your model has an extra low holding tank and/or plumbing traps, etc., take that into consideration when traveling on non-surfaced roads. Roads with a high center crown containing boulders can damage under-chassis plumbing. Long trailers and trailers which have very little ground clearance may drag on the ground when coming out of a dip. Skid bars and skid wheels will help in many situations, but usually will not protect from damage caused by a high center crown as well as a dip. Tight turns, even on paved roads, should be examined carefully if you are towing a trailer that is extra long. The tow vehicle may be able to follow the road only if the trailer cuts across the corner. Trees, curbs, boulders, soft shoulders etc. may damage the trailer if pulled across the inside of the turn. The rear of the trailer may also swing in an arc that is also occupied by a tree, building, post etc. If you intend to do much off highway travel, carry along an axe, small bucksaw, tow chain and cable, a shovel and a couple of three or four foot boards that can be used to aid you in getting unstuck. A tow chain or cables are sometimes helpful and a power winch may be a practical option. Loosen the tension of your sway bars when maneuvering in and out of camp areas to reduce stiffness in turning. In slick conditions of snow and ice, loosen sway bar adjustments. In extreme cases, over-tightened sway control bars could force your tow vehicle to go straight ahead instead of turning in the direction you turn it. CAUTION: If you get stuck, do not race your engine or spin the wheels. Prolonged efforts to free a stuck vehicle may result in damage to your engine, transmission or rear axle. Most RV’s require leveling and stabilization (blocking up) with some kind of jacks for comfortable occupancy. But more important, the unit must be level in order for the absorption type gas refrigerator and drainage system, (both which function by gravity), to operate properly. Place a level on the bottom of the refrigerator/freezer compartment or in a normally level location inside the vehicle to determine proper levels. Bubble levels are furnished with some refrigerators and are available from your RV dealer. 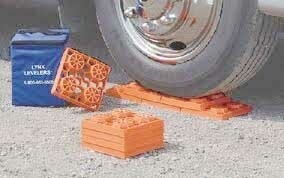 Use leveling blocks under the wheels to obtain side-to-side levelness. After leveling, check that the wheel chocks are tight against your tires. When the unit has been leveled side-to-side and front-to-back, you may wish to permanently attach levels on the front and/or back and sides of the trailer or truck camper or inside near the driver, on the side wall and dash panel of a motorhome. This will allow you to tell at a glance if you have stopped on a level site, and will help speed up the leveling process. Various types of screw-type stabilizer jack stands are available to block the RV in a level position. Some are freestanding types while others are permanently installed on the bottom of the RV. Of course, many motorhomes have built-in stabilization jacks that make leveling easy as the touch of a button! Camping as well as off road traveling can be great fun for you and your family. Being prepared and informed about how to avoid getting into tricky situations will make your trip that much more enjoyable.